The English wine writer Hugh Johnson once remarked that the recondite nature of German wine is one factor in its suitability for academic study. A prime example might be Mosel Auslesen. This category includes wines of many types, and in successful vintages, which recently seem to have occurred nearly every year, it is not uncommon for most of the best wine estates to produce numerous Auslesen, sometimes as many as five or six, from the same vineyard in the “traditional” style, that is, sweet or fruity, not dry or off-dry. To complicate matters, there is no uniformity in the manner in which estates distinguish among these Auslesen. If one wants to have a reasonably good idea of what to expect from a particular wine, one must know the specific estate’s code or how to interpret its label or capsule. For many wine drinkers, these factors are intimidating and may constitute an obstacle to the exploration of the wines. Yet the quality of the wines makes the effort to learn the abstruse codes worthwhile. If I were to compile a list of the most enjoyable German wines I’ve tasted, a disproportionate number would be Mosel Auslesen. The list would certainly include, to name just a few, a 1959 Eitelsbacher Karthäuserhofberg Burgberg feinste Auslese, tasted in 1972; a 1971 Joh. Jos. Christoffel Erben Ürziger Würzgarten Auslese, consumed at “sweet 16” in 1987; and a 1989 Maximin Grünhäuser Herrenberg Auslese number 94, drunk just a couple months ago. Such wines combine the rich and complex fruit often found in Beerenauslesen and Trockenbeerenauslesen with the elegance and refreshing acidity characteristic of the best Mosel wines of less exalted status. In this article, I hope to provide some information that may make these wines more approachable, even for those who until now have overlooked or avoided them. There is some evidence that the designation “Auslese” was first introduced in the Mosel region in the final years of the 19th century. Michael Broadbent, who has made a career of tasting older wines from historically great vintages, lists only one 19th-century Mosel Auslese among his published tasting notes, an 1895 Brauneberger. 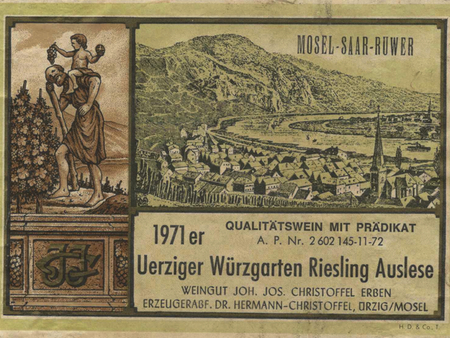 The dearth of such wines in his tasting notes may not be surprising, as various 19th-century and early 20th-century wine writers have noted that Mosel wines were viewed at the time as early maturing wines for immediate consumption. Mosel wine, including Auslesen, originally were fermented and aged in the traditional 1,000-liter oak Fuder casks for at least two years. In Otto Loeb and Terence Prittie’s 1972 work on Mosel wines, one finds a couple references to Mosel Auslesen from vintages of the first two decades of the 20th century, but it wasn’t until the 1921 vintage that such wines were produced in abundance.1 This process continued for decades in the region’s most successful years, 1934, 1937, 1949, 1953, 1959, and 1964, before a watershed occurred with the implementation of a new wine law in 1971. The new wine law had two significant consequences for Mosel Auslesen. The first was a prohibition on the use of various subjective or laudatory terms, for instance, “feinste” above, by which Mosel producers (and some in other regions of Germany) had indicated particularly outstanding casks of Auslese and Spätlese. 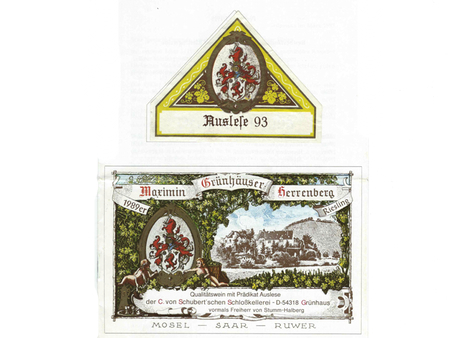 Cask or Fuder numbers that commonly appeared on the labels of Mosel Auslesen were also prohibited. The second consequence was the use of ripeness, as measured by grape sugar or must weight, as the basis for classifying wines, including Auslesen. The law established 70 degrees Oechsle as the minimum level for a Mosel Kabinett, the lowest category of Prädikat or unsugared wine, 76 degrees Oechsle for Spätlesen, the next category in the hierarchy, and set the minimum must weight for Mosel Auslesen at 83 degrees Oechsle. Since the minimum must weight for Mosel Beerenauslesen was set at 110 degrees Oechsle, one can see that the range of Mosel Auslesen was very broad, potentially much greater than the range of Kabinett or Spätlese. Even though the minimum must weights for Mosel Spätlesen and Auslesen subsequently were raised, the range of the Auslese category today still permits the production of wines of a quite varied character even among those in the traditional style. One shouldn’t infer that with the advent of the new law that better Mosel estates abandoned their former practices or methods of select picking. Nor is it unreasonable to think that the parameters for the category of Auslese in the new law reflected to a large extent pre-existing standards rather than creating a new use of a well-known term, as was the case with Kabinett.2 There is, however, one change that has gathered momentum not because of the wine law but because of the frequent occurrence of hot growing seasons in Germany during the last 25 years, namely declassification. In very hot years such as 1990 (for some), 1999, 2003 (extremely warm), 2005, (perhaps) 2009, and 2011, many fine estates brought in an entire harvest of fruit of at least Auslese must weight. Typically they declassified the less promising wines, offering them as Kabinett wines and Spätlesen, while marketing some of the better ones as Auslesen. One further official change that occurred within a decade of the law’s inception was the introduction of the terms “trocken” and “halbtrocken” to refer to dry and somewhat dry wines, respectively. Beginning in the early 1980s, Auslesen of each sort were routinely produced by nearly every top Mosel estate; their number is now waning, not because of a decreased interest in ripe dry Mosel Riesling, but rather because these wines are now marketed increasingly without any use of the predicate “Auslese” on the label. For those estates that are members of the VDP, many of these wines that are under 10 grams of residual sugar will be designated Grosses Gewächs (GG). If the bureaucrats and, by extension, consumers of fine Mosel wines expected that with the release of Auslesen from the 1971 vintage, producers would no longer make any qualitative distinctions among them, they were quite mistaken. Even if the prohibited terms had to be eliminated from wine labels, there are other ways to skin a cat. The first approach to making such distinctions was by alterations in the capsules. According to an article in the now-defunct magazine Wine, Otto Loeb and the English wine critic Harry Waugh visited the Joh. Jos. Prüm estate in the summer of 1972 to taste wines from the 1971 vintage. One interesting feature of the article is that some of the 1971 Auslesen still are referred to by the old, prohibited terms. It would appear that this was nothing more than the estate’s own, internal way of comparing the wines of the new vintage with those produced prior to the new law. For a few months later, when the J.J. Prüm wines appeared on the American market, their labels merely read “Wehlener Sonnenuhr (or Graacher Himmelreich) Auslese”; however, some had gold capsules (Goldkapsel) instead of the estate’s usual white capsule. Something similar was done by Egon Muller in the case of select 1971 Auslesen from Scharzhofberger and Wiltinger Braune Kupp. Another well-known estate, S.A. Prum, used capsules of various other colors to distinguish different batches of Auslesen. Today gold capsules are the most common way for prestigious Mosel estates, including Fritz Haag, von Kesselstatt, Reinhold Haart, Dr. Loosen, Schloss Saarstein, Zilliken, St. Urbans-Hof, and many others, to indicate their top Auslesen. Nevertheless, this device can still lead to confusion or false expectations for consumers of these wines. Many estates now use long gold capsules for the very best Auslese in a given vintage and short gold capsules for those just a notch below. But without having examples of both types from the same estate for comparison, it may be difficult to tell what sort of gold capsule is on the bottle in question. This may not be a problem for purchases at the estate or at the major regional auctions, such as the Grosser Ring, but the situation is different when wine is purchased at shops or restaurants far removed from its source. Furthermore, there are estates whose gold capsules do not necessarily indicate their top Auslesen. Willi Schaefer and A.J. Adam use gold capsules on all their wines; Dr. Thanisch – Erben Thanisch bottles all its Bernkasteler Doctor wines—Kabinett, Spätlese, Auslese, and so on—with gold capsules. The second common way for Mosel estates to identify or distinguish their Auslesen is by means of stars on the label. Top producers currently employing this method include J.J. Christoffel Erben, Jos. Christoffel, jr., Markus Molitor, Selbach-Oster, and a few others. Schloss Lieser also used the star system before converting to gold capsules about a decade ago. One complicating factor is that the system is not used univocally. In outstanding vintages, Selbach-Oster has offered a no-star Zeltinger Sonnenuhr Auslese, as well as Auslesen from the same vineyard with one, two and three stars;3 in a number of vintages J.J. Christoffel’s Auslesen from the Ürziger Würzgarten vineyard covered the full range from no stars through four stars. In such cases, the system is essentially a ranking or hierarchy of Auslesen from a specific vintage. On the other hand, it also has been used as a grading system across vintages. J.J. Christoffel frequently marketed a sole Erdener Treppchen Auslese with two stars. Similarly, Markus Molitor’s wine list shows that in a couple vintages the estate offered only a three-star Auslese from certain vineyards. There is another code that is worth mentioning. Although the 1971 Wine Law prohibited any distinctions among an estate’s different Auslesen from the same vineyard (aside from different AP or test numbers required to market the wines), including the use of cask or Fuder numbers on labels. For decades, Maximin Grünhaus has used cask numbers on the small neck label of select Auslesen (see picture) that invariably sell for higher prices than the usual Abtsberg and Herrenberg Auslesen without cask numbers. Additional complications in attempts by Mosel estates to distinguish their Auslesen involve the use of multiple systems. We’ve already noted that the Jos. Christoffel jr. estate uses the star system; however, in certain vintages it also has a three-star Auslese with a gold capsule. In the last 15 years, the von Hövel estate on the Saar has employed three different kinds of special designations: gold capsules, stars, and (on rare occasions) cask or bottling numbers. The owner of the estate, Eberhard von Kunow,4 once told me that in the 1989 vintage he offered the estate’s best Auslese without a gold capsule or any special designation. His customers were confused and questioned him about the price disparity between this wine and the other Auslesen produced that year by the estate. As a result, he began using gold capsules for his best Auslesen. Although the Selbach-Oster estate has retained the star system for some of its Auslesen, about a decade ago it began to use the names of select vineyard parcels or pre-1971 vineyard sites instead of stars on some en-bloc-picked Auslesen in Zeltinger Sonnenuhr and Zeltinger Schlossberg, such as Rotlay and Schmitt, respectively. By focusing on different ways Mosel estates distinguish their Auslesen, we have not addressed what for many consumers may be the most important questions of all: What do the special designations tell us about the nature or qualities of the wines, themselves? What differences exist between Mosel Auslesen with gold capsules or stars and those that are bottled without any special features? We can say that generally the former will be richer and will contain a higher percentage of botrytized fruit. This is not surprising, since often an estate’s top Auslese from an outstanding year will be a declassified Beerenauslese or will include a small amount of juice that had it been produced in larger quantity would have been bottled separately as a Beerenauslese or Eiswein.5 However, as in the case of the codes or devices estates employ to distinguish among their Auslesen, there is also a lack of uniformity in the criteria estates employ for Auslesen with gold capsules or three or four stars. A few estates, for example, Molitor and Bischöfliche Weingüter Trier, each with extensive holdings in the Mosel region, have noted on some of their wine lists that in order for an Auslese to be bottled with one, two, or three stars (for Molitor) or a short or long gold capsule (for the Bischöfliche), it must have a minimal or average must weight well in excess of that required by the wine law. Many other estates use gold capsules or three/four stars only for heavily botrytized wines, irrespective of must weight. 1. The 1921 vintage was also the first year that Beerenauslesen and Trockenbeerenauslesen were produced in the Mosel region. According to Loeb and Prittie, Spätlesen were not common until the 1920s. 2. In The Great Wines of Germany, published in 1963, Simon and Hallgarten include a list of three Spitzenweine (top wines) from the Trier State Domain for each of the most successful vintages from 1921 to 1959. They provide the vineyard name, must weight, and acidity for each wine, but with the exception of a few Trockenbeerenauslesen, there is no indication of their classification or how they were marketed. In the 1947 vintage, must weights of the wines range from 92 to 99 degrees Oechsle, roughly in the middle of the new wine law’s Auslese category; in the case of the 1953 wines, the range is from 100 to 118 degrees Oechsle, from high in the Auslese category to low in the Beerenauslese category according to the new law. 3. Selbach-Oster produced a Zeltinger Sonnenuhr Auslese with a gold capsule in 1989. It would appear that its use of the star system began with the 1990 vintage. 4. At present, Eberhard von Kunow’s youngest son, Max, runs the estate. 5. For example, in the 2005 vintage, the top Auslese produced by the Knebel estate in Winningen had a must weight of 140 degrees Oechsle, approaching TBA territory. Like many estates’ top Auslesen, it was intended for sale at one of the regional wine association’s annual auctions. In this case, it was the Bernkasteler Ring auction. Images courtesy of Eric Steinberg. Eric Steinberg is a former professor of philosophy and administrator at Brooklyn College of the City University of New York. He wrote an e-book titled Understanding Mosel Wines and has continually enjoyed fine Mosel wines since 1971. Thank you for the article, Eric. I’ve always found the star system confusing because even if I am very familiar with a producer, as with Selbach-Oster or Christoffel, it’s hard to keep track of how many stars they are using in a specific vintage. Likewise, your example of Thanisch-Erben Thanisch using a Goldkapsel for all of their Doctor wines means that you have to look at the individual producer before assuming that a given wine is some special selection (to paraphrase Caymus). Also, having recently purchased some pre-split Thanisch Doctor Spätlesen, I can verify that the Doctors received gold capsules at the unified estate as far back as 1979. A couple of other oddities to throw in: First, Sybille Kuntz has made a DreiStern Spätlese Trocken, but I’ve never seen any of her wines with either one or two stars. Similarly, on a non-Mosel note, Gunderloch has made a 3 star Auslese Trocken (not sure if they still do, or if it’s been superseded by their Rothenberg GG). I’ve seen merchants refer to this wine as “Gunderloch Auslese 3 Star – dry style”. To my knowledge, there is no one or two star Auslese from Gunderloch unless they made one many years ago – I have enjoyed a GK Auslese from them, however. As always, thanks for your comment, Andrew. You bring up some good points and examples, including Gunderloch. Perhaps someone can enlighten us. Thanks for posting this article, it’s extremely helpful—-and a reminder, if another was needed, of why Americans are so confused and intimidated by German wine labels. It’s just too much to ask of a regular consumer, even an enthusiastic and educated one, to memorize all of the different labeling foibles of their favorite estates. But that’s old news. What I wanted to add here was an expansion on the points made about Auslese vs GKA (gold capsule auslese). My experience has been that Mosel winemakers (and Nahe ones as well) will often call a wine GKA, not because it is more botrytized than their regular Auslese; in fact, just the opposite. It’s because the wine in question lies stylistically BETWEEN Auslese and BA for them—-in other words, the wine may possess a very high must weight but isn’t botrytis-affected ENOUGH to qualify for what he or she considers classic BA. In low botrytis years like 2012, I tasted a fair number of deliciously clear, clean Auslesen and GKAs with modest botrytis, but exceedingly little BA and TBA at all, largely for this reason. It’s nice for the growers to have an in-between category, I think. But seriously, once they go off-roading into stars, AP #s, cuvée numbers, LGKAs and whatnot, they’ve entered the zone of navel-gazing and lose a lot of their potential audience. Oh, and I can respond about the Gunderloch, which I distribute in New York. There is no one or two star wine from them, true; just the three star Auslese. And that wine is generally a Feinherb style, not a Trocken, because it’s made the old fashioned way: a spontaneous fermentation with natural yeast is allowed to finish on it’s own with no temperature control or manipulation, thus landing the finished wine at whatever sweetness/dryness level is determined by the conditions of that year. It is not made in every vintage. It’s usually an amazing wine and ages gracefully. But again, how does one know what it really is from the label? And how does one market such a unicorn in a world where German wines are divided into “sweet” or “dry” with Draconian bluntness? I’m still trying to solve that riddle. Evan, I appreciate your excellent reply and your insight on Gunderloch in Rheinhessen. Gunderloch’s dry-tasting three-star Auslese reminds me a little of Emrich-Schönleber’s Monziger Halenberg “R” on the Nahe, which is also neither “dry” (trocken) nor sweet. This near-dry style is more common in the Mosel region. As you point out, a number of producers make an off-dry wine and call it feinherb, even if the term “feinherb” isn’t on the label. Evan, your point about the basis of the distinction between regular Auslese and gold capsule Auslese (GKA) is well taken. One distinction I did not explore in the article is that between a GKA and a long gold capsule Auslese (LGKA). In an article on the 1990 vintage, written many years ago by David Schildknecht, he quotes Wilhelm Haag on the distinction. Haag said that a GKA “must have pronounced botrytis tone and plenty of body, whereas a LGKA can perhaps…be more filigree, more delicate, with more spritz, characteristics which would not be appropriate in a Beerenauslese.” This distinction was exemplified in my tastings of various 1999 GKA and LGKA at Haag’s estate, as well as at Schloss Saarstein. Thanks much for your insights, Eric and apologies for only belatedly (and at Lars’ prompting ;- ) remembering to read and respond to them. Your references to “declassification” follow a very common practice in writing about German wine Prädikats, but I am convinced it is a slightly misleading practice. Even setting-aside how much riper fruit has typically continued to get over the past three decades and concentrating on the situation that prevailed during the 1980s or early 1990s, a significant share of the most quality-conscious and successful German Riesling growers already then recognized not only that the 1971 Wine Law was fundamentally flawed in its reliance on must weight as the sole proxy for ripeness, but also that in comparison with characteristics exhibited by Rieslings that had traditionally been designated as “Spätlese,” “Auslese,” or “Beerenauslese,” the minimum must weights established in 1971 were ludicrously low. So even during that period, a high percentage of the benchmark growers set their own internal standards for what would count as a wine worthy of any given Prädikat, and to the extent that must weight played a role for them in deciding how to label a given bottling, their wines as a matter of routine significantly exceeded the legally-established thresholds. What’s more, even then – but especially since – the internal standards set by quality-conscious growers have meant that the significance of a given Prädikat varies considerably from one estate to another. Such variability in estate standards and practices is, to be sure (as you illustrate) even more pronounced when it comes to the significance growers attach to gold or “long gold” capsules and the manner in which these designations, or stars, modify a Prädikat (not only, albeit most significantly, that of Auslese). And incidentally, one also sees this phenomenon starkly in the case of dry wines. For a long period from the late ‘70s through the mid-‘90s, there was a pretty widespread consensus among German Riesling growers that a Prädikat designation should also be used as a means of marketing and calling attention to the quality if not also the character exhibited by one’s ostensibly better dry wines from really ripe grapes. And there was a narrower but still widespread consensus that “Spätlese” would designate one’s ostensibly best dry wines, not because these failed to achieve the must weights legally stipulated for Auslese – on the contrary, many growers wisely came to recognize that to make excellent dry wines they had to work with fruit that often met the legal requirements for Auslese – but rather because they thought it would be confusing for consumers to refer to dry wines as “Auslesen” given the traditional association of that designation with sweet wine and with botrytis, not to mention with wine rendered – as the name indicates –from selectively picked grapes. My descriptions above already suggest why I think it is a bit misleading to refer to the labeling practices in question as “declassification.” What’s more, that term is more usually associated with choices growers make on the basis of perceived quality not to sell a wine under its usual description and legal entitlement (say, as Vosne Romanée Les Suchots or as Echézeaux) but instead under a designation associated with less prestigious wine (say, as village Vosne Romanée or – in the case of the grand cru – as Vosne premier cru). And one can only fit into this mold the choice of a grower to bottle his or her Riesling as Spätlese rather than as Auslese insofar as one assumes the former to designate a less prestigious wine than the latter, an assumption which I trust that all of us devotees of German Riesling would emphatically reject, insisting instead that the best Spätlese is not perforce less-outstanding than the best Auslese but only different in type. Your description of how stars are used actually understates the existing degree of variation and even downright idiosyncrasy. Molitor’s system, incidentally, refers to must weight, hence his employing it for dry, off-dry and sweet wines alike. And for a three-star Molitor Auslese the minimum must weight is borderline T.B.A.! Incidentally, it’s also a bit misleading to suggest that Selbachs utilize parcel names “instead” of stars. Their en-bloc bottlings began life labeled for the specific sites in question; there was never a period when wines of this sort were essayed chez Selbach and then labeled with stars. And one should surely ask: “Must this all be so complicated?” even though I admit to having no clear answer to that question. I think much could be achieved by a bit more voluntary consensus among growers. I appreciate for example – and am not entirely ill-disposed toward – the drive underway in the VDP but illustrated widely outside that organization as well, to eliminate Prädikat terms from dry wines. (I’d love to make an exception for “Kabinett,” but that’s a separate topic for another occasion, and indeed one I have frequently addressed.) But I fear that the uses to which such designations as “gold capsule” or the attachment of stars have been put are now so varied and often idiosyncratic that this genie can never be put back into the bottle – or should I write ‘kept confined to the back label’? What’s more (though this, too, is a subject for another occasion and one I have indeed elsewhere addressed) attempts by the VDP and by other growers who would imitate them to banish legally-permitted categories and designations and to tightly structure the way in which Riesling is labeled, exert a pressure that must be relieved somehow if a poor grower is to do justice to the diversity of terroir influences, the stylistic malleability of Riesling as raw material, or even (what nerve such growers have!) to his or her own aesthetic vision. And the way in which that pressure is in fact being relieved is for winery-internal designations and fantasy names to proliferate, as well as for familiar designations to diverge increasingly in significance. A grotesque example of the latter (but merely one among many that, as already intimated, represent a subject matter in themselves) is use of “Alte Reben.” These two words on a label nowadays by no means always point to age of vine, but instead are often used as a code for “halbtrocken” or as a term of endearment to compensate for VDP insistence that a certain vineyard is no longer worthy of mention on a label; that use of Prädikat designations be restricted; or that a “grand cru” name may only be used for one dry-tasting wine each vintage. Thanks for your thorough reply to Eric’s essay, David. You bring up a number of important points. In regard to “declassification,” I’m glad you talk about this in more detail. It should be noted that many of the Mosel Auslesen of the past didn’t always have much residual sugar and were aged in cask for a couple of years. Though I understand the trend to leave off Prädikat terms for dry wines, there still should be a means for those growers who would still like to highlight that their dry or off-dry wines are unchaptalized. If applicable, they should also be able to indicate that the wine is “light” (Kabinett trocken/feinherb) and comes from a single vineyard—i.e., a Naturwein. The VDP classification model fails in this regard. Eric: Ulli Stein more than once made the analogy that wine guides and critics should be ranking wines like in boxing, that is according to weight (Prädikat). He says that a lightweight boxer (Kabinett) can be great as well. But how often does a Kabinett—and certainly not a Kabinett trocken—get a score in the high 90s? For those critics who like to use the 100-point scale, the highest-scoring Mosels are usually sweet wines. Likewise, John Ritchie says, “I love seeing a professional critic recommend drinking Kabinett Trocken over the next 15 years and beyond.” He’s referring to John Gilmans’s recent notes in a View From the Cellar on Hofgut Falkenstein. Not only does he praise the two Kabinett trockens, but he gives them a high score. Most wine critics feel a dry Mosel Kabinett has a drinking window of just five years or so, which is not necessarily true of the best examples. Regarding Mosel Auslesen “of the past,” Lars, as you will recall, I have correspondence and records of conversations with Georg Immich from the 1980s in which he states that the halbtrocken rendition of Batterieberg Auslese that he offered in good vintages from the ’60s through the ’80s was closer to what he recalled from his youth as Auslese than was the residually sweet bottling that he rendered alongside. And, mind you, this was a residually sweet Auslese harboring fewer grams of residual sugar than do most of today’s residually sweet Mosel Kabinetts! What’s more, not only did Immich consider the halbtrocken renditions to generally be the more nuanced and ideally balanced and always the more useful at table, he also voiced his fervent belief that halbtrocken was the golden mean whose virtues growers would gradually once again embrace. If you ask me, it’s a shame given that all of his other points were correct that he could not have been more wrong in his prediction! Of course, the steady inflation of residual sugar among those German Rieslings that still harbor any significant amount has multiple causes. But one is certainly tied-up with the shift in ripening patterns and consequent changes in the significance associated with Prädikats. When Loosen says “today, my Kabinetts are Auslesen” he means to call attention to the selectivity and difficulty involved in harvesting an alcoholically delicate and only subtly sweet wine in vintages of rampant must weight accretion. But it’s an ironic comment in that today’s Kabinetts are sweeter both analytically and organoleptically than were typical Auslesen of 30 or more years ago. And among the reasons for this is simply that leaving more residual sugar behind is an essential tool for lightening alcohol in vintages where median must weights are simply too high to permit crafting of Kabinetts that are analytically or organoleptically close kin to Kabinetts of the ’80s or ’70s. Now, one might understandably ask “Why not simply pick earlier?” And in fact, in growing regions around the world, earlier harvesting is becoming an important tool for must weight and alcohol management. But even though the notion of “phenolic ripeness” is ill-defined and often abused, it certainly points to a key truth. How much of a problem under-ripe flavors would be if one simply harvested for Kabinett significantly earlier is indeed a very good question. But leaving aside the influence of consumer expectations and of consumers’ evolving notions of what tastes ripe or under-ripe, there are very important reasons why Mosel Riesling growers hesitate to harvest earlier. For one, the phase shift in growing season has proceeded to such a point that early harvest is highly likely to coincide with late-summer heat. And even in an era where cooling chambers are becoming common, picking warm grapes is problematic, as is picking while insect (especially wasp-like) populations are still high. Furthermore, many growers are convinced – and a lot of anecdotal evidence as well as that of my palate suggests – that hanging though a cool period is critical to complex and felicitous evolution of Riesling aromas. And at the very least, there is a strong consensus that even if Nature doesn’t deliver refrigeration, Riesling still needs extended hang time to show its true mettle. A Kabinett from the ’80s is likely to have been harvested in October, often well into that month. Today it’s more likely picked in late September. And there is also the practical consideration that a significant portion of most Mosel Riesling harvests is still likely to be delayed into mid- or even late-autumn in hopes of cooler weather and noble dessication. So in order to start picking earlier and in effect achieve Kabinett reflective of a very different ripening regimen, one would need a very long harvest crew tenure, and getting good pickers soon- and long-enough is already a huge problem. Well, my comments have taken us far-afield from the proximate topic of Auslese labeling! But I hope they demonstrate the extent to which myriad issues critical to Mosel style and quality are inextricably interrelated. Going a little further back to the heyday of the 1890s, Mosel Auslesen were probably most often what today is called feinherb. Yet the Mainz-based wine broker and author Karl Heinrich Koch wrote in his book titled Moselwein that most Mosels weren’t designated as such (much less as Spätlese) and were typically light-bodied, brisk, and dry-ish. Rheingau, in contrast, was well known for noble sweet Auslesen. As with Ernie Loosen of Dr. Loosen, other Mosel growers, including Alexandra Künstler of Weiser-Künstler or Johannes Selbach of Selbach-Oster, talk about the difficulty of harvesting ripe grapes, but not too ripe, for true Kabinett—whether fermented in the dry, off-dry, or sweet style. This has led some growers, like Selbach, to seek cooler sites. Nevertheless, I still don’t understand why more top producers can’t make fruity-sweet Kabinetts with less residual sugar, even if the alcohol is slightly higher than before. Egon Müller, for example, decided to make his Scharzhofberger Kabinett with less sweetness. A client in Singapore, he says, brought this to his attention several years ago. Though it’s vital to pick Riesling later when it’s ripe, I suspect some growers tend to poker and wait too long. Yields play an important factor as well. Some have higher yields for making lighter wines but which can lack depth. Müller has always been very clear that he has no truck with “Kabinett” in the sense of the 1971 Wine Law or in the sense of a lightest category of wine at all. Rather, he says he views his wines so-labeled as the stylistic equivalent of those that his ancestors would before 1971 have labeled as “Naturwein” or “Naturwein Cabinet.” So the fact that they may if anything be a bit more robust than a Spätlese doesn’t bother him. I would be the last person to argue with his excellent results. But the notion of Kabinett – by analogy, say, to Steinfeder in the Wachau heirarchy (which however is now truly nearly impossible to achieve annually!) – as one of especially delicate and alcoholically light wine is not something to which Müller subscribes. Right, higher yields can be part of the solution but as you note, one can’t risk taking them to the point where the resultant wines lose character. When I visited Scharzhof on Easter, Egon Müller said that he wanted to have his Scharzhofberger Kabinett at no higher than 30 or so grams of residual sugar. 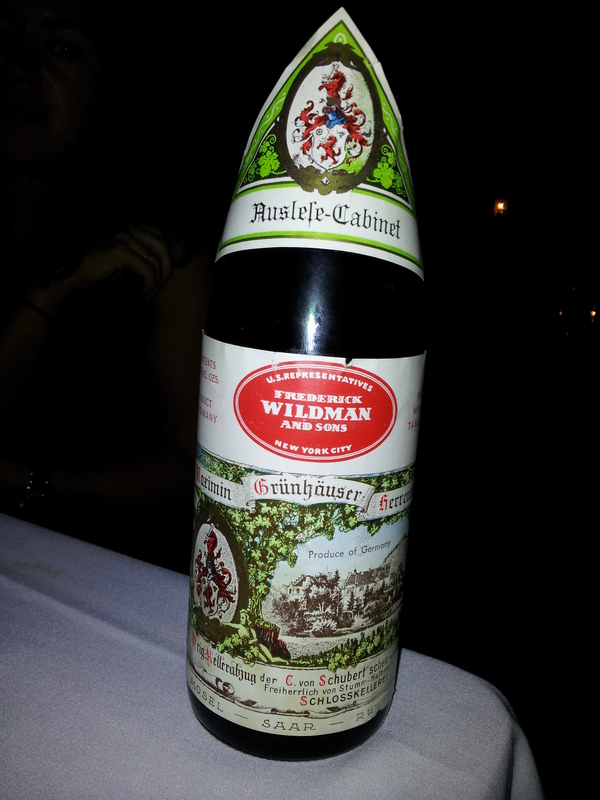 In addition, a basic Naturwein was the precusor to today’s Kabinett. His Spätlesen are sweeter than his Kabinetts, and his Auslesen are almost always made from grapes affected with botrytis. You’re welcome. Now, I’m a little confused. What is Müller’s notion of Kabinett then? He said that it should not be too sweet. In the Rheingau tradition—whether spelled Cabinet, Kabinet, or Kabinett—it was a reserve bottling (or in French cuvée spéciale). I like that von Hövel is also making fruity-sweet Kabinetts with 20 or so grams of residual sugar from the 2013 vintage. Yet other top producers’ Kabinetts have much higher residual sugar. Some of these receive plenty of accolades, but I often find them too sweet. In my glossary and on the Grosser Ring auction list, the abbreviation for Goldkapsel is GK and for lange Goldkapsel LGK. The purest magic is when all this vitality is captured in the relative delicacy and miniature scale of a Kabinett wine. It is not so difficult to be impressive with forceful late-gathered Spätleses or Ausleses. It is when the region is judged on what it can pack into its lightest category that the Rheingau, along with parts of the Mosel, the Nahe, and the Rheinpfalz…..stands out as one of the world’s greatest vineyards. There are more mentions of the Kabinett Prädikat in this volume, all of which imply syle consistent with this definition. For instance, the Glossary of German wine terms on p. 231. It’s interesting, however, that Johnson includes this note in the section for the Rheingau, although its use is obviously not limited to this Anbaugebeit. Questions: is this the first use, by Johnson or others, of the word in this manner? Is Johnson’s main intent in this description of a fine Kabinett mainly intended to emphasize the great change in meaning in the word in its newer spelling, or is he simply indicating a personal preference for a certain type or style of wine? Actually, the spelling “Kabinett” existed in the 19th century, along with “Kabinet” or “Cabinet.” They all had the same meaning. See “Unlocking the Kabinett,” including the comments under the second part. A basic Naturwein was the precusor to Kabinett, so this style of wine existed before 1971. I don’t understand why Hugh Johnson highlights the Rheingau as having the most delicate style of Kabinett in his Modern Encyclopedia of Wine (1983). And why would he write only “parts of the Mosel, the Nahe…”? The Rheingau was best known for Kabinett or, better yet, Cabinet, in the former sense of the term—namely, as a reserve bottling. I don’t have reference to Johnson’s older volumes to know for sure when he first defined the modern use of the term “Kabinett,” but it would seem to be the 1983 edition of the encyclodepia. On a side note, I’ve come across the word “Ausbruch” in reference to late-harvest Mosel wines, including “Cabinetsweine,” in Otto Beck’s book on the Mosel and Saar from 1869. By the way, where can I find facilities for editing what I write in this Reply column? Once you post a comment, there’s no edit function. I, however, can edit your reply. Just email me what I should edit in your reply/comment. I don’t have access to any earlier an edition of Hugh Johnson’s Encyclopedia. But I suspect from context that what he wrote in praise of Kabinett was intended to refer to a style rather than merely to post-1970 wines officially labeled with that designation, and would as such apply to the best non-Spätlese (-Auslese &c.) Naturweine of an earlier era. But thanks, John, for this striking reminder of how much has changed in the last 30 years, so that delicacy is effectively all but entirely out as a VDP-Riesling-virtue, and in particular the suggestion that Kabinett epitomizes Pfalz Riesling virtues would be greeted by today’s VDP Pfalz-Vorstand as though the writer had three eyes.